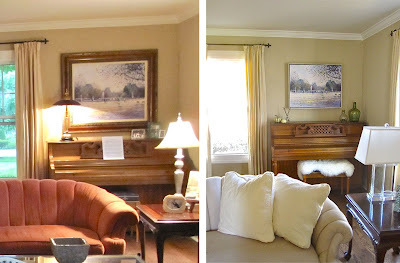 Here are a few of the detailed before/afters of my mom's living room makeover. When she and I decided to tackle this room, purchasing new (and often overpriced) furniture was never really an option. Instead, refurbishing old pieces, reframing paintings, and updating lamp shades did the trick we were looking for! ***Note: The walls were NOT repainted. Any disparities are just a change in lighting/camera flashes in the room. ***Click on the images to see them in closer detail. We reframed the large Paris landscape painting over the piano, replacing the bulky, brown and gold frame with a thin, floating silver frame. Floating frames are sleek and contemporary and often used in art museums. Their minimalism puts all the focus on the art itself. Close-up of a floating frame. For those who don't know what these are, there is a space between the painting itself and the frame. Kinda cool! 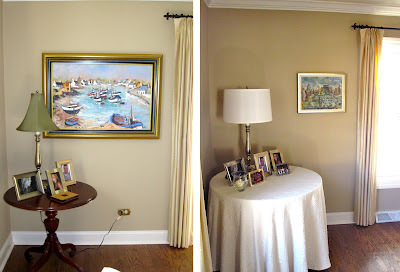 We replaced the oversized seascape painting and thick gold frame with a smaller-scale, softer-colored oil painting (that I purchased in a resale shop for $35) in a thin silver frame. Switching out the fancy shmancy silk lamp shade with a drum shade from Restoration Hardware modernized an otherwise dated lamp at a much lower cost than purchasing a new lamp. Throwing a white, custom tablecloth over further lightens up the space. 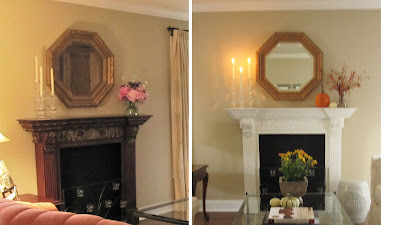 The dark wood and gold mantel was refurbished in a solid white paint to match the moldings. Photos of the final room redo coming tomorrow!